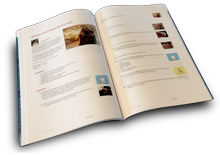 Order a professionally printed, perfect bound cookbook with a full color glossy cover and 12 recipes. What a great idea Tammy! That's so nice of you to use one of my recipes,especially nice on the first page! Have a happy Thanksgiving. Will you make a pumpkin recipe?